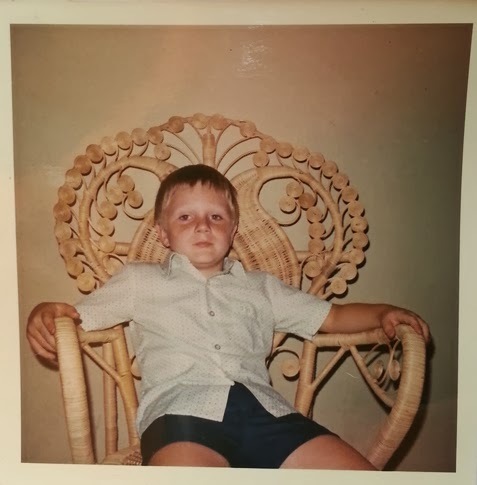 Anthony as a kid looks like he's a future Bond villain - kicking back and taking over the world...as you do in a fancy cane chair! Great haul of pottery - just gorgeous! You're a lucky (well deserving and gorgeous yourself) girl. Yay for continuing with the blogging Kylie. It's great to have you back again. What a sweet husband to buy such a beautiful little dish for you. I love ox blood pottery. The two vases are great too. I love that little hint of green on the rim of the black one, and the mustard colored one is perfect in that little grouping. I looked at the pottery site and love that charger. I also like the condiment jar. It was so nice to be scrolling through and find a post from you. I say just post when it feels like fun. We'll be thrilled to read anything from you...anytime you want to write it. Oh yay the excitement of seeing you pop up on the reader.........happy happy dance....which you must have done when you found the little 50c vase.......yay yay yay. Fabulous collections of amazing pottery......you always display them so beautifully. That Anth is impressive I tell ya. My Mr would never buy me pottery. He usually sticks to what he knows...fishing gear. Anthony=keeper. He's a good egg, and he clearly knows your taste perfectly, the clever man. All your pots, wherever they're from, have great style, and as has already been said, you display them perfectly. And I like Creepy Boy, he's rather sweet! Slowly catching up here, I'm sooo behind on my favorite blogs....So glad to see not only one, but two posts from you popping up in my feed!!! I'm so thrilled to hear that last bit, Kylie, that you feel you're starting the blogging business all over again. That sounds very promising, I love having you back!! 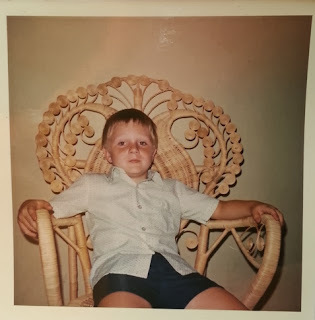 What a cutie, your Anth, handsome already:-) And that chair! Gorgeous!! Oh, the pottery, what an amazing man to buy you pottery!!! Mine would never do that! Love all your gorgeous pieces! Oooh, beautiful. All of it - you have quite the collection! And I don't think the boy is creepy at all, he looks great next to the vases.